When will be Quack Pack next episode air date? Is Quack Pack renewed or cancelled? Where to countdown Quack Pack air dates? Is Quack Pack worth watching? 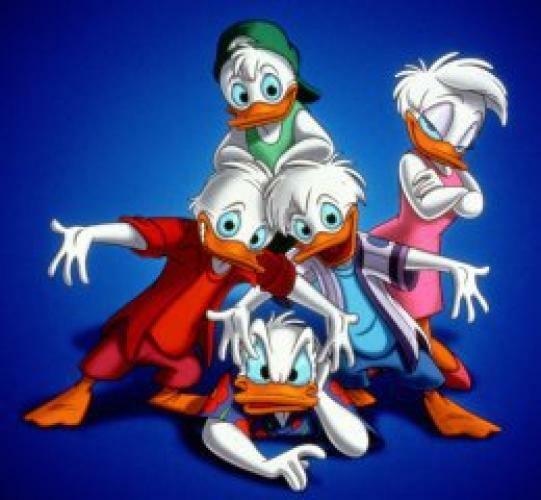 Quack Pack follows Donald Duck's nephews Huey, Dewey, and Louie,who are portrayed as rebellious teenagers in this series. Unlike their earlier portrayals with the identical outfits and duck-like voices, Quack Pack gives them different outfits and conventional voices. Huey is the leader dressed in red, Dewey is the computer whiz dressed in blue, and Louie is the sports fanatic dress in green. They all live with their Uncle Donald, who just wears a casual Hawaiian shirt, and even has a job as cameraman for newswoman and girlfriend, Daisy Duck. They make his life very difficult and sometimes get him mixed up in crazy situations, but he still loves them no matter what. EpisoDate.com is your TV show guide to Countdown Quack Pack Episode Air Dates and to stay in touch with Quack Pack next episode Air Date and your others favorite TV Shows. Add the shows you like to a "Watchlist" and let the site take it from there.